Here, the two leading scorers through the regular season face off against each other. Stan Mikita and Norm Ullman faced each other several times in the playoffs. (March 25, 2004) -- "One of the highlights that pops into my mind is the two goals in five seconds (I scored) against Chicago in the playoffs," recalls Norm Ullman, when asked to identify one of his favourite highlights from an illustrious career. "It seemed like we played Chicago in the playoffs quite often at that time," laughs Norm, shaking his head in disbelief. He's absolutely correct  Detroit and Chicago met in the Stanley Cup final in 1961, and were combatants in the semi-finals in 1963, 1964 and 1965. The Red Wings finished first overall in the regular season, compiling 87 points to best second place Montreal by four. Third place Chicago finished with 76 points. Chicago's Stan Mikita won the scoring race collecting 87 points, but Norm Ullman finished second, earning 83 points on a league-leading 42 goals as well as 41 assists. 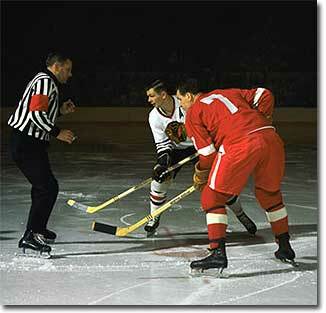 In fact, Chicago and Detroit monopolized the top five in the scoring parade  Mikita and Bobby Hull of the Hawks finished first and fourth while Detroit's trio of Ullman in second place, Gordie Howe in third and Alex Delvecchio fifth completed the top five regular season scorers for 1964-65. "They were favoured to win the Stanley Cup for a four or five year stretch," remembers Ullman. Chicago had a powerhouse team in the early 1960s, icing a squad that featured future Hall of Fame members Glenn Hall in goal, Pierre Pilote on defense and the high-flying Bobby Hull, Stan Mikita and Phil Esposito at forward. And Dennis Hull, Kenny Wharram and Bill Hay added that much more offense to an already explosive lineup. On Sunday, April 11, 1965, Norm Ullman recorded a hat-trick, including an NHL record two goals in five seconds. This is the game's scoring summary as it appeared in the Hockey News. The lead-in line was "Explosive Normie Ullman was the whole show." Game 1 of the semi-finals between the Wings and Hawks took place April 1 in Detroit. The hometown Red Wings edged the Hawks 4-3 with Ullman scoring the deciding goal. Game 2 was April 4 in Detroit, with the Wings doubling Chicago 6-3. Norm scored for the second consecutive game. The series shifted to Chicago for Game 3, with the Hawks dumping Detroit 5-2 on April 6. Two nights later and still in Chicago, the Black Hawks eked out a 2-1 squeaker to tie the series at two games apiece. The teams returned to Detroit April 11 for Game 5. Eric Nesterenko of the Hawks opened the scoring mid-way through the first but Detroit's Ted Lindsay evened the score at 19:19. The second period opened with Bobby Hull putting Chicago back in the lead just shy of the fifteen-minute mark. Then, it was Norm Ullman's turn to shine. "I brought the puck out of my end and skated down the ice," Ullman explains. "I was the only one coming down (the ice) so there wasn't much chance of doing anything. I was coming down the right side and I went straight at the defenseman on that side. Then, I cut across the blueline and over into the middle. The other defenseman was there but I just used him as a screen and fired the puck along the ice. Glenn Hall didn't see it. I was surprised - he had cat-like reflexes and was probably the best goalie in the league at that time." 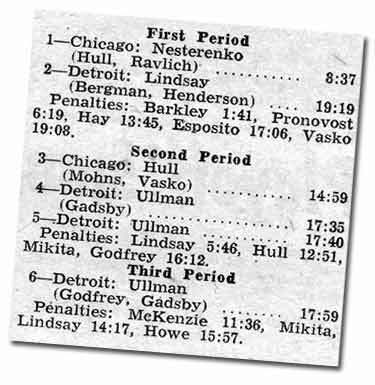 With the Hawks' Stan Mikita and Detroit's Warren Godfrey serving matching minors, Norm Ullman had tied the score at 17:35 of the second. 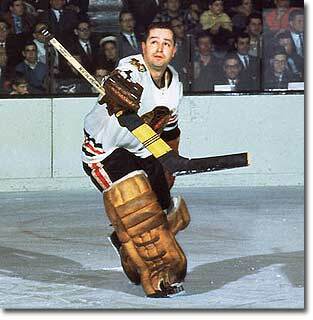 The victim of Norm's production on April 11, 1965 was Glenn Hall, who Ullman calls "probably the best goalie in the league at that time." "From the faceoff, Eric Nesterenko (of Chicago) had the puck in his own end. I saw him look over his shoulder at the defensemen. I thought, 'He's not going to dump it out; he's going to give it to the defenseman.' So I changed my course and went straight over in between the defensemen and Nesterenko. Sure enough, he fired the puck over and I was right there to pick it up. The defenseman came to me to check me. I took a stride or two and he came and I used him as a screen and let it go and it went in." Ullman had scored his second goal of the night at 17:40  amazingly, just five seconds after his previous goal. "One goal was along the ice inside the one post and the other one was on the ice inside the other post." The feat was hard for Norm's Red Wing teammates to believe and even more incredible to the gob-smacked Chicago Black Hawks. "I did it but it's still hard to believe that it happened. It was amazing, and all within five seconds. It would have taken longer than that (ordinarily), especially with them having possession of the puck but it didn't take long  just boom, boom." The rapid-fire goals put Detroit up 3-2. Norm added another goal at 17:59 of the third to give himself a hat-trick and Detroit a 4-2 win, putting them up three games to two in the series. The two goals Norm Ullman scored in just five seconds stands as an NHL playoff record. "Strange things happen in games," Norm admits. "You never know!" Chicago went on to win the hard-fought series four games to three. The victorious Black Hawks faced Montreal in the Stanley Cup final of 1965, with the Canadiens winning four games to three. Norm Ullman finished the playoff scoring race in sixth, with six goals and four assists in just seven games. Kevin Shea is Manager, Special Projects and Publishing at the Hockey Hall of Fame.